A jaw-dropping 88.22-carat, flawless D-colour diamond is set to lead Sotheby’s Hong Kong Sale of Magnificent Jewels and Jadeite on April 2. It’s estimated to fetch a staggering HK$88-100 million (S$15-17 million), and is one of only three oval diamonds that weigh over 50 carats to appear at auction in living memory. “When you think that one ton of mined earth yields less than a carat of diamond, and that high-quality diamonds over 10 carats are a rarity, the discovery of a 242-carat rough, of gem quality and exceptional size, is nothing short of a miracle,” says Patti Wong, chairman of Sotheby’s Asia, before adding that the oval gem is “a wonder of nature, a masterpiece resulting from man’s ability to shape the hardest material on earth into an object of ultimate beauty”. Finding a rough diamond that’s big enough to fashion a stone of over 80 carats is extremely rare. Originally a 242-carat rough gem from Botswana, this dazzling piece was worked on for months before being cut into 88.22 carats—the number eight is a symbol of perfection, often associated with prosperity, in Asian culture. Other auction highlights include a 20-carat diamond ring, with an estimated value of S$1.9-2.7 million, and a ruby and diamond bracelet weighing a total of 40 carats. Keep reading for Tatler’s edit of the most notable diamonds sold at recent auctions. A private collector acquired an exceptionally rare 102.34-carat diamond through Sotheby's last April, which is the only known round brilliant diamond that weighs over 100 carats to have achieved perfection by all critical criteria: colour, clarity, cut and carat. One month later, during an auction in Geneva, two D-colour flawless white diamonds—a 51.71-carat round diamond and a 50.39-carat oval diamond—sold above their estimate for S$12.6 million and S$11 million respectively. On the same month, a Fancy Vivid blue diamond pendant necklace by Moussaieff fetched an eye-watering S$27.6 million at Christie’s. A truly spectacular jewel, this beautiful gemstone weighed a total of 8.01 carats. Christie’s Geneva presented The Pink Legacy at an auction late last year, and it is the largest and finest Fancy Vivid pink diamond ever offered by the company at auction. 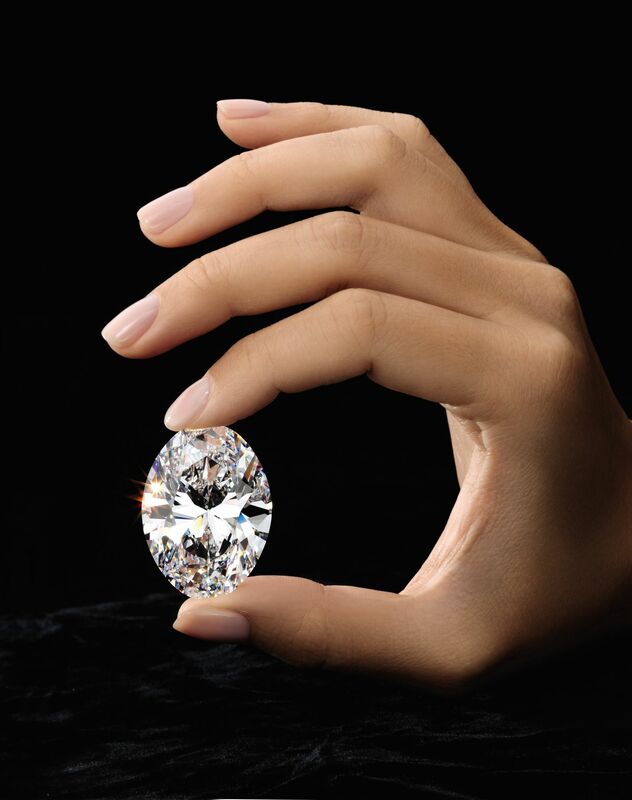 Weighing in at just under 19 carats, the stone was purchased by Harry Winston for a record-breaking S$67.5 million.